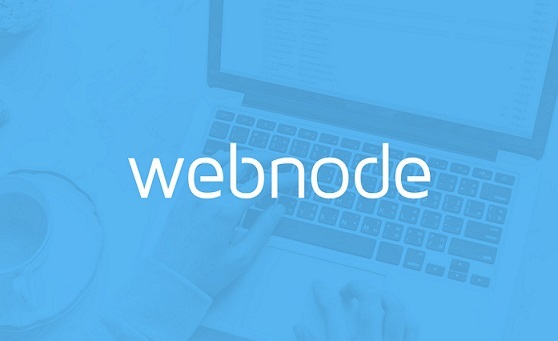 Webnode’s newest feature is one of our most requested. 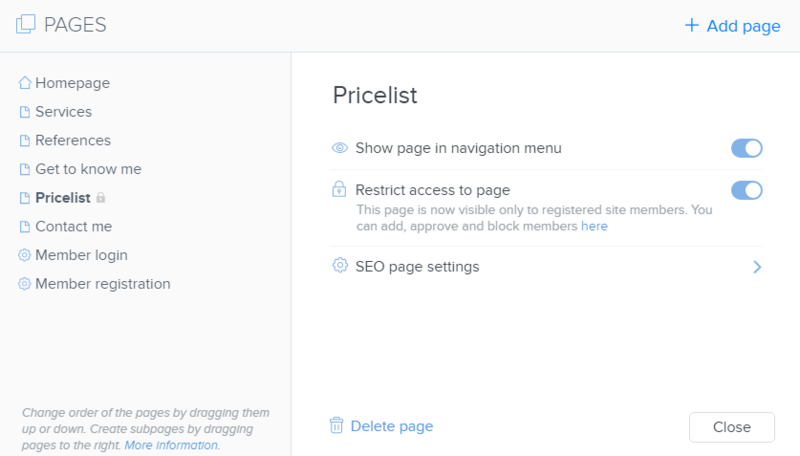 You will now be able to restrict access to selected pages of your website and make them visible only to approved site members. With our easy-to-use member management system, you will have complete control over who can view your website’s private and sensitive information. With Membership Registration, you can easily share pictures and special announcements on your family website with only your family and relatives. You can create a members-only area for clients and business partners. You are able to share particular content from your blog or online portfolio only with selected users. Membership Registration is perfect for these as well as a wide variety of other uses. You can easily restrict access to any existing page, photo gallery, blogpost, your entire website or add new restricted pages. For a step-by-step guide to setting it up, please see our Knowledgebase. Make sure to plan what content should be private before you add a restricted page. Then, fill it with texts, photos or videos and then press publish. 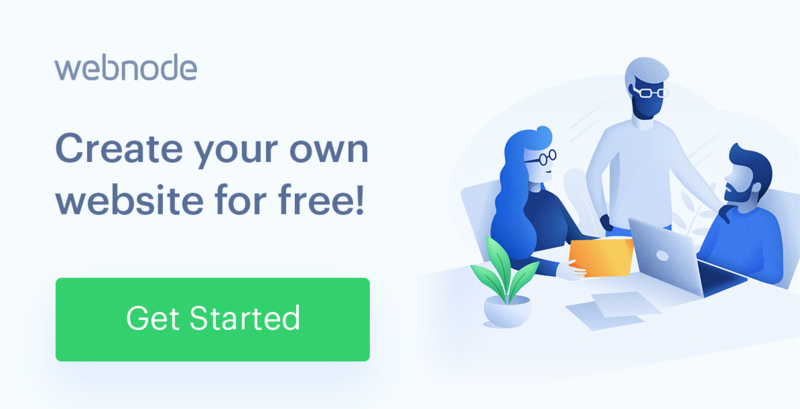 Once you restrict access to a page, this page becomes private and your visitors will be shown the registration and login form instead of the content. They can view your website’s private pages only after they register and are approved by you. The easy-to-use member management system found in the administration of your website allows you to add new members, grant them access, block or delete them with only a mouse click. With a Standard Premium Plan, you will be able to give 100 members access your website’s private pages. The Profi Premium Plan allows you to have an unlimited number of site members. Save time: Do you want to make all pages on your website private? No problem. Just restrict access to your homepage and all pages of your website will follow suit and become restricted. 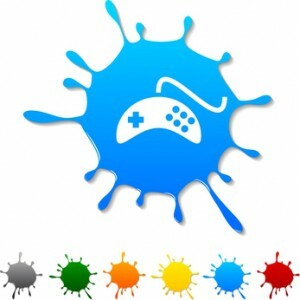 Customize: You are able to customize the registration form and login page on your website. Add a field for your visitor’s address or number of their membership card. Request any information you need to grant them access. Site under construction: You can easily restrict access to the content you are currently working on and make it accessible after you have completed the page. Under lock and key: Each page or blogpost with restricted access will have a little lock icon next to its name so you can quickly and easily distinguish between private and public pages. 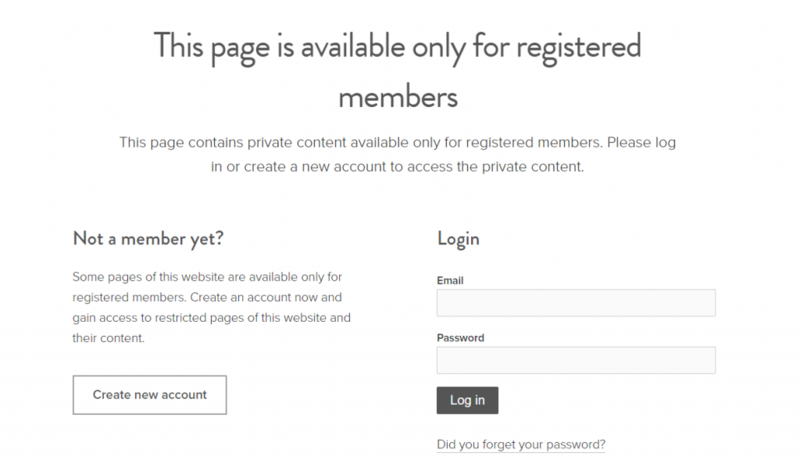 With Membership Registration, you will have full and complete control over who can view and interact with your website’s private content. Are you planning to use this feature on your website and want to know more? Leave us a comment or a question in the comment section below.